Thirty participants will undergo a week-long learning experience aimed bringing them up to date with the latest football trends relating to their roles as referees. Five provinces are represented at the course including Honiara with the majority, Guadalcanal, Malaita, Rennell and Bellona, Western Province and Makira Ulawa. FIFA referee instructor and Oceania Football Confederation (OFC) Referee Development Officer, Mark Hester, is working with five local instructors to deliver the course content over the week. The local instructors are namely Robert Sulimae, John Sa’ohu, Christopher Saeni, Reggie Iemane and Hugo Hebala. The course covers FIFA 11 for Health for Referees, trends in analysis of fouls, fitness test protocols and exams to be completed by the participants. Quite important is the referee fitness test that will be conducted at Lawson Tama on Wednesday. Member of the Solomon Islands Football Federation (SIFF) Normalising Committee, Adrian Wickham, was at the opening ceremony this morning and encouraged the participants to utilise the opportunity given to them. “I urge you all to learn as much as you can from our very experienced instructor who is going to be with you this week. Ask questions and share ideas so that this experience can be a worthwhile one for you and for football development,” Wickham says. 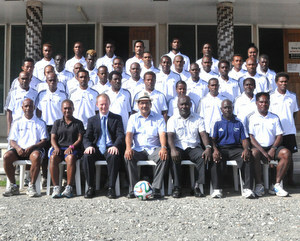 Wickham also acknowledged FIFA and OFC for supporting football development in Solomon Islands through the course. “I want to acknowledge the President of FIFA and the President of OFC for their commitment to Solomon Islands. I also want to thank the FIFA Referee Assistance Program for its efforts developing referees in Oceania and abroad,” says Wickham.